The greatest compliment you can pay yourself is to surprise YOU! Yes, I can say that because I experienced that just today, despite concerns of being uncomfortable, missing a ladies' singles 3rd round match on tennis TV, bringing too little or too much food among a lengthy list of worries. I decided to pull myself together and friends to accomplish something that was ordinarily so not me! I have too many acquaintances and friends to put together in one room so let alone track all of them. They're all over the place, some of them are in government work, call centers, the entertainment industry etcetera. There are people who tend to lead the more mundane, lackluster but rather comfortable life while there are people I know who have led wayward lifestyles and a few of them have had brushes with the law. Some of them have been unfortunate enough to be doing time in jail for trespasses proven by a court of law or anything resembling legality in any form. This was originally a friend's idea and he had mentioned it to me but it took root in my mind rather steadfastly. It was something I could not remove that easily from my thoughts and the longer I thought about it, the more it took on flesh and blood. He proposed visiting a few of our friends from the gay/Ts community in Mandaue City who were unluckily in prison right now for a variety of crimes. It would just be a simple visit to check on them, chat them for a bit, bring them a bit of food which I am sure they were not able to enjoy inside, he said. I said YES because it sounded easy enough but you all know that feeling when we approve of something rather quickly when it's imposed on us all of a sudden and then when the rational "US" takes over, apprehension takes over and lots of questions form in our minds. But then for me this wasn't the case. As the days unraveled the whole idea just suddenly became uncomplicated and more elementary when I thought about it, covered all the loopholes I myself created and answered all my own questions. So it was all systems go. My friend has this tendency to procrastinate but we decided to do it today, Sunday, the 30th of the month. I prepared food to bring with us. I had to unlock his lazy knot and nudge him off of his sleep by giving him a call and then we were on our way. Prison has its own protocol and we soon learned it even before we set foot inside. There were no objects of questionable appearance and shape allowed inside. We had to leave our cellphones in the car. They tasted my bubblegum to make sure it was just gum and checked on my credit cards on the assumption perhaps that they might be sharp enough to warrant as weapons? It bordered on the ridiculous but I am sure experience is on their side and they would probably have been prepped to play the percentages and make sure nothing illegal could be exchanged inside. That is pretty understandable to me. The conditions inside the city jail were not the best if I may be allowed to say so. There are at least 8 people tucked into one room there with every possible space maximized. Double-decked beds and tiny tables and chairs of every imaginable shape and size were tucked into tiny cells. Was it Lilliput on a slightly more human scale? The place was packed with too many people. I felt quite disturbed though that I was actually inside the jail. My mind programmed the occasion to take place in some receiving area within the building. I would be talking to my prison friends seated on wooden chairs, food on a white, lengthy table and the place reasonably ventilated from the open space. Too many prison movies logged onto my mind perhaps? Reality bit too hard as I was really really surprised to find myself and friends INSIDE an actual prison cell and talking to our gay friends who were doing time there. It is easy to get caught up on the stories and sometimes even flash an enviable stare or two at them because of the abundance of men inside but reality sets in when you think about their highly regimented life, quality of living and health inside and lack of freedom to compartmentalize your life the way you want it organized. When they talk about the kind and the amount of food they were being fed, the food I brought took on an ambrosia-like quality that I never thought was there. When we bought them cigarettes it was as if manna had fallen from heaven. They went insane over a few sticks of cigarettes. Reality is everything that we could easily procure outside took a bit more effort to acquire inside. When they talked about punishment I cringed at the thought that they were castigated with a weapon made out of rubber, and steel which inflicted purplish welts on one's body. These are realities that put things into perspective. There is a reason why my friends were there and there is a reason why the place exists. In an obscure little corner about a block from where I live is a slice of heaven on Earth. There is a narrow, short alley leading to this paradise, sort of strange considering how positively ugly the pathway looked with ordinary cement walls on both sides and how extraordinary the place it led to was. This was from way back in my childhood days when the sun was a friend and we were tireless and taut. I would often go there with my cousins to buy beautiful little creatures that we put in our aquariums and tiny little ponds. I could still very well remember the owner's name. We called him Mr. Vic. HE seemed like a magician to me. He had the "water" thumb. He sold and bred freshwater fishes of almost all varieties. Everywhere in his little nook where small, beautiful, green ponds filled with the most vibrant and beautiful fishes I have ever seen. There were platys, swordtails, carps and kois, plecostomuses, mollies, barbs among so many things. 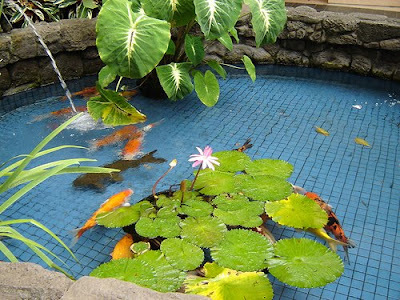 His ponds were very tastefully decorated too with well-placed lotuses and weeds. Fishes of all sizes swam and glided gracefully along the moss-covered bottoms and their leafy surroundings. There were canopy-like stretches of trees to keep his charming little nook cool and sort of darkish which added to the mystique of the place in my imagination. As I look back from the outside at this place now that I am older, a bit more mature and perhaps with some cynicism to me, I've often thought how time has slipped by too fast for me to forget that I used to marvel at how beautiful this place used to be. How does it look inside now? I probably would never get a chance to see it considering it is closed in the evenings and I am now most of the time a creature of the night and the sun has become an enemy? Is the man still alive and does he still have the magic in him? Does the place still hold an allure to me if I am led to it again? Maybe it will hold a different meaning for me now that I have experienced too many things, both bad and good? It might be a cure for my depressive episodes these days or an abomination of a reminder from my once-monotonous childhood days? Isn't life ironic? Now that I'm earning money it seems I have almost lost my desire for the beautiful, little things in his mystical, little nook? Or is this indicative of deeper things such as a general disinterest for so many things that I used to like? Have I lost my passion for the simpler joys that the world has to offer? Maybe this is the process of moving on to more fruitful endeavors or have I just lost myself in the tepid, murky waters of time and life?